Player 1 has used her remaining tiles but Player 2 can still make a word. Is the game over when Player 1 uses up her remaining tiles, or does it end when Player 2 cannot make any more words? My Scrabble rules state that when player uses all tiles, game is over or when other player cannot make a word. Hi Henry - Once the bag is empty (i.e. there are no more letters left), the game is over as soon as one player uses up the last of his/her letters. If neither player can use up all their letters, then they just keep taking turns until neither player can make any more words. Because players are allowed to pass their turn, Scrabble tournaments often introduce a rule to make sure the game doesn't drag on forever by saying something like: 'The game is over after six consecutive scores of zero' (i.e. three consecutive passes or false-words per player). So assuming the bag was empty in your scenario, Player 1 wins. 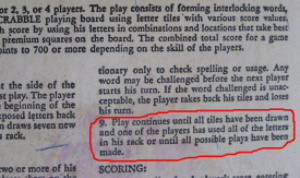 This is how Scrabble is played in serious tournaments, and is also the rule stated on the official Hasbro site, and on the Scrabble lid from my own game, which was made back in the early 1960s (see the highlighted rule in the picture I've attached to the top of this post). If the wording on your game is significantly different to this, can you please record the rule word-for-word as a comment to this post? I would be interested to read it. Comments for When does a Scrabble game end? What do the rules say when a player can make a word but is unwilling to make it? the rules seem to suggest that the game ends when all letters have been drawn and one player uses his or her last letter; or when all possible plays have been made. well, a play can be made, but SHE won't make it. A player is not obliged to play a word just because he/she can. If they feel it is in their best interest to pass, even when a play is possible, they are entitled to do so. This holds at any stage of the game, including the very end.